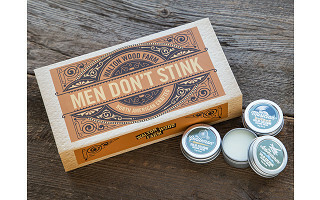 Walton Wood Farm uses a “farm forward” approach with their natural bath and body products. High quality, sustainable ingredients are sourced from the U.S. and Canada, and their process is cruelty-free. They also leave out parabens, dyes, and SLS—a common but irritating cleanser. The farm is run by a pair of adventurers. 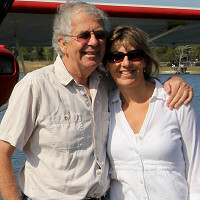 Leslie is a Coast Guard veteran and wilderness hiker, and Peter’s a farmer and bush pilot. They pack their outdoor experiences and unique perspective into their goods. The solid colognes are a great example of their approach. The soy-based scents are light and fresh. 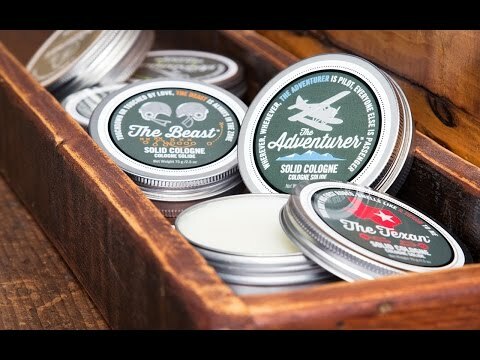 Each features a name like “The Texan” (with subtle notes of tobacco and hints of fresh-cut cactus) or “The Beast” (a citrusy blend of lemongrass and mandarin with manly traces of cardamom and pepper). The fragrance is subtle, and you only need a dab. It travels and stores well, too. The generous amount will last for months, or even a year. 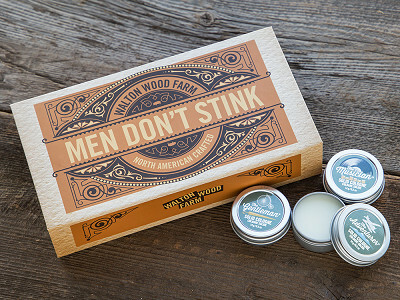 Peter and Leslie’s personalities and humor shine through these goods that feel and smell good. Hello Everyone. I'm very excited to meet you and answer questions about Walton Wood Farm solid colognes and saving historic barns! How do you purchase a cologne without smelling a sample. Do you have any available?? A solid cologne with a manly base, notes of tobacco, followed with a heart of exotic spices, crowned by hints of fresh-cut cactus. Masculine fragrance, with a splash of orange, middle-notes of petitgrain, jasmine and rose, followed by base-notes of amber, white musk, and rosewood. Sporty and aquatic, top notes of grapefruit, bergamot, and fresh ozone, followed by gentle middle notes of watery-green-leaf, neroli and rosemary, and ending with musky notes of spruce and cedar. Vibrant top notes of bergamot, mandarin and green tea leaf, followed by the heart of jasmine, and lily of the valley, finished with amber, sandalwood and white musk base notes. I really like this idea, but without being able to smell them I wouldn't know which one to choose because I don't have a particular fragrance that I like. If I go into a store to buy cologne, I just spay them all until I find one that stands out, sometimes two, but I have to be able to smell them. That's the only way that I can choose. If you had a sampler pack, kinda like what the lip balm comes in, I would gladly pay for that so that I can find my favorite(s). @Christopher I completely understand. I love your idea and we are taking that on board. Thanks for commenting. I love the lip balm packaging idea. I would definitely like to try the product because I like the packaging and presentation, but I need to smell it first. Good idea Leslie. @Leslie I agree with the above comments. A variety pack in a "lip balm" twist up style would be awesome, and pocket sized. You could reapply anywhere, and you wouldn't get the scent on your fingers! I would gladly pay for a variety pack of small samples! I usually wear Safari for my daily cologne. Which scent do you think would best emulate that fragrance? Also, I would buy a sample pack of a smaller size to help determine which scent I like best. Could women use one of these scents? Looks like a brilliant product but I, like the other commenters, am hesitant since most colognes I try smell great in the bottle and awful on my skin. Go figure! I usually wear Gendarme which is difficult to find. I am guessing your Snipe, Adventurer, or Gentleman fragrance would suit me. Do you have an exchange policy if I order one and its just awful on me? @Leslie - I wear Gendarme V, which I think is the original and it is floral without being sweet. Spicy doesn't work for me. Also it is fairly subtle on me, or maybe I use it sparingly, but I always get a compliment when I hug someone :-) If strength is not the issue would you still recommend the Texan or Beast? Hi Leslie I like the concept assuming your priced in Canadian Dollars right? I agree with Mary, would like to smell something before I dropped nearly 40 buck on it. I would be willing to purchase a sampler of mini-tins that included all your products. I would think you could do that and still make a profit off the sampler or at least break-even. Just a thought, I do like the form factor. Here is our return policy, Kevin! Hi Lloyd, I just discussed it with the team and unfortunately it would meet that disclaimer. We will talk to Leslie and her team about ways for you and other interested customers to know what the scent is before breaking the seal of the product as that is our biggest concern with returns. It's a reasonable thing to want beforehand and we will try to make that happen. Stay tuned! @kelly This product is great for teenagers on the go. And bonus; mom is spared the experience of smelling their sons an hour after they've left the house. 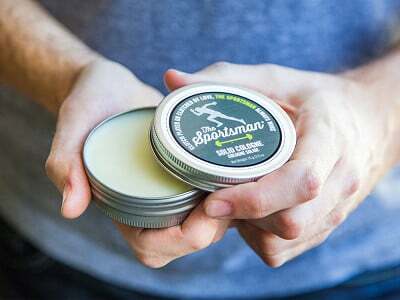 I think The Texan, The Beast, or The Sportsman may be a good fit for you sons. Thanks for asking! Thanks much for your quick reply! I don't see where anyone has asked this....but how long does the scent last after you apply? Is it on par with a typical liquid cologne? @David That is an important question. Our product is more subtle than traditional cologne, but lasts about the same time as a traditional cologne in the $40-75 range. The main difference is that people generally think once they can't smell a cologne on themselves, the scent is gone. That is incorrect. Your nose has probably become accustomed to the scent. Fun fact; this is actually an evolutionary survival trait. If you can smell it all the time, it is too strong and probably infringing on peoples 'air space.' Our cologne is highly portable and controllable, and therefore, you can reapply whenever you like. This ensures that you are not "overdoing it" in the morning. This product is not ideal for "the club" where men like to really stand out (maybe not in a good way). Another great quality of our cologne is that is highly moisturizing. Traditional cologne has alcohol in it, which is very drying to the skin. I love the fragrance of Old Spice (original) - It reminds me of my late father. I'm an old dude, now and Old Spice is all I'll wear. Any chance you'll obtain a license to add that fragrance to your product line? The solid cologne concept is exciting and I really like the idea, but I don't want ever to smell like anything but Old Spice. Was interested until I read soy-based. Soy is an estrogenic compound - interested why you would use this in a men's product. @michael That is a great question and I see how you would be concerned! Like any natural ingredient, there is information on both sides of the gate. If soy compounds in non-pharmaceutical creams were powerful enough to change a person's estrogen, the women's health world would be over the moon with such an inexpensive solution to a big problem. Please be assured, one would have to internally consume a very large amount of soy, combined with other dietary and lifestyle factors to affect estrogen levels in a human being. We also use Cannabis Sativa (Hemp Seed Oil), in our cologne, but that will not cause any negative health issues, in fact, both soy and cannabis have many positive health attributes. The THC in the Cannabis Sativa is removed, so use will not create a positive drug test. If you were to buy a traditional liquid cologne, the bottle would be filled with water and alcohol as the filler. I will go out on a limb and say I don't like the idea of my children 'spraying' anything that can be breathed into their lungs. A natural crème-based product, I believe, is simpler better for the body.